So......after my Hostess Hoedown, I am atoning for my sugary sins by cooking a lovely vegetarian meal from Myanmar (formerly Burma). Anchored by brown rice, topped with a variety of unlikely (at least to me) stir fried vegetables and a side of stir fried spinach from Hopestill Farm, an organic farm in town that supplies me with a spectacular weekly cornucopia of leafy greens, this meal was satisfying and healthy. Forgive and bless me Green Goddess, I promise to change my pastry-lovin' ways...until the next time. Located in southeast Asia, Myanmar (Burma) is bordered by the People's Republic of China, Laos, Thailand, Bangladesh, India and the Bay of Bengal with the Andaman Sea on the southern coast. 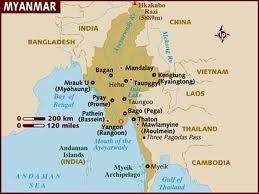 The name Myanmar is promoted by the military which strictly governs the country. Although the name has not been approved by the legislature or the U.S., it is generally accepted by many countries and the U.N. Mainly Buddhist, the country was conquered by the British in the 19 century, finally gaining independence from the Indian Empire in 1948. Along with abundant natural resources, this beautiful country is notable for it's golden pagodas. Owing to it's proximity to China, India and Thailand, Myanmar's food reflects these rich culinary traditions. Extensive use of fish sauce and fish paste, seafood (on the coast), meat, poultry, fresh water fish, salads (thoke), noodles, rice, potato, ginger and kaffir lime are just some of the staples and seasonings typical of Myanmar's cooking. Cook rice in 4 cups of water until tender. While rice is cooking, prepare vegetables. Heat oil in wok and stir fry the garlic for a about 30 seconds. Add the prepared vegetables and stir-fry for 3 minutes. Add the sesame seeds after 2 minutes. When the rice is tender, stir in the sesame paste, and vegetables. Sprinkle with a little soy sauce and lemon juice and serve hot with sesame tahini to taste. Add garlic and stir fry for 30 seconds. Add spinach and saute until wilted (but not soggy). Add sesame seeds and toss. Final Assessment: This was a wonderful, simple and satisfying dish. I've never stir-fried cucumbers or radishes, but they were excellent! The addition of tahini, lemon juice and basil added flavor and fragrance to the meal - a little dash of low sodium soy sauce, a pair of chop sticks, and we were all happy, happy, happy....and healthy!